from Beyond the Great Wall: Recipes and Travel in the Other China, p. 86. I have owned this fabulous cookbook less than a week and already several pages, including this one, is bespattered and wrinkled. As I went through the book page by page in the bookstore, I stopped counting when I reached the tenth recipe I knew I would make if I owned it. That’s my minimum. (On the same visit to the bookstore, I had the same experience with David Chang’s Momofuku, but that’s another post.) The day I brought the book home I made two salads, this Mongolian one and the Cucumbers in Black Rice Vinegar from Xinjiang (I have NO idea where that is). I have the summer ahead of me to delve more deeply. In the meantime, this is a salad that will suit the summer heat. Pouring boiling water over the shredded cabbage in a bowl, waiting a minute or two, and then draining it keeps the color of the cabbage bright and the leaves still a little crunchy. About 1/2 cup coriander (cilantro) leaves. Slice the onion lengthwise into quarters, then very thinly slice each quarter lengthwise. You should have about 1 cup. place in a sieve, add 1 teaspoon of the salt, and toss well. Set over a bowl and let stand for 10 minutes to drain. Meanwhile, place the cabbage in a bowl and pour over boiling water to cover (about 4 cups). Let stand for a minute or two, then drain in a colander. Place back in the bowl and set aside. 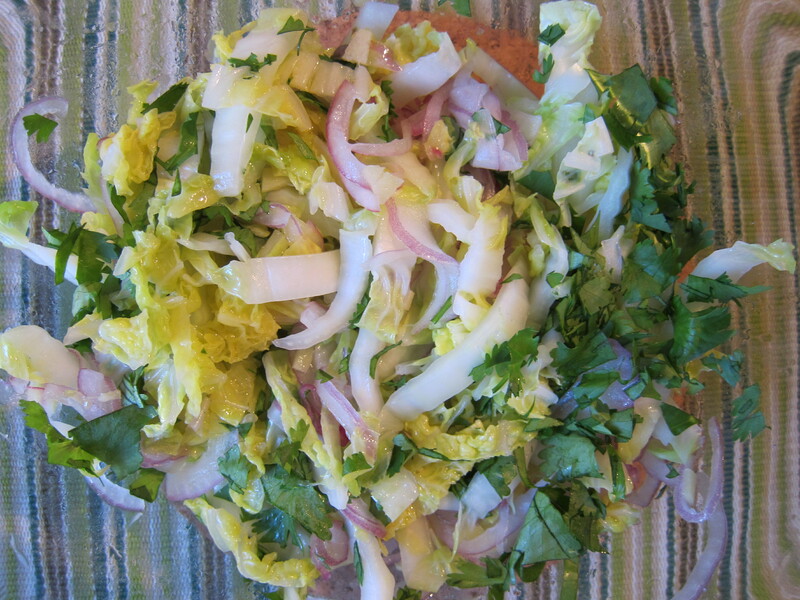 Rinse the onion with cold water, then squeeze dry and add to the cabbage. Set aside. Heat the 2 teaspoons sesame oil in a small wok for small skillet over medium heat. Add the ginger and cook for about 1 minute, stirring frequently to prevent sticking. Add the vinegar, and once it bubbles, pour the mixture over the salad. Toss to blend, then add the remaining 1 teaspoon salt and toss again. The salad can be served immediately or left to stand for up to an hour so flavors can blend. Just before serving, taste and add a little more sesame oil if you want to bring that flavor forward, as well as more salt if you wish. Add the coriander leaves and toss.